Refugees for over six decades, Palestinians in Syria face a precarious legal status given the civil war and renewed displacement. Mai Abu Moghli – a PhD candidate at the Institute of Education, University of London explains how some are falling through the cracks of the international protection regime and calls for a solution based on human rights and international law. "These are now doubly vulnerable, doubly displaced and falling through the cracks of the international protection regime." In 1948, a year that shapes the modern history of Palestine, more than 750,000 Palestinians were forced to flee their homes or expelled during and after the ‘Nakba’ (‘Catastrophe’) and the creation of Israel. Palestinians sought refuge in neighbouring countries: Lebanon, Jordan, and Syria. A smaller number went to Iraq and Egypt. Others went as far as Chile. The civil war in Syria since 2011 has intensified the plight of Palestine refugees there, many of whom have been living in exile and have remained stateless for over six decades. These are now doubly vulnerable, doubly displaced and falling through the cracks of the international protection regime. "These waves of refugees highlight the vulnerability of Palestinians to the turbulent political context of Arab host countries." Palestine refugees arrived in Syria in waves; the 85,000–90,000 refugees who fled there in 1948 were from the north of Palestine. In 1967, many Palestinians were among the 100,000 people who fled from the Golan Heights to other parts of Syria when the area was occupied by Israel. Some Palestinians fled to Syria in 1970–71 from Jordan following the Black September civil war there. A few thousand fleeing war-torn Lebanon in 1982 also took refuge in Syria. Many tens of thousands fled or were expelled from Kuwait and other Gulf states during and after the Gulf war of 1991, and from Libya in 1995, after the Oslo Accords were signed. Up to 5,000 Palestinians were forced to leave Iraq following the 2003 war and found refuge in Syria in 2006. These waves of refugees highlight the vulnerability of Palestinians to the turbulent political context of Arab host countries. 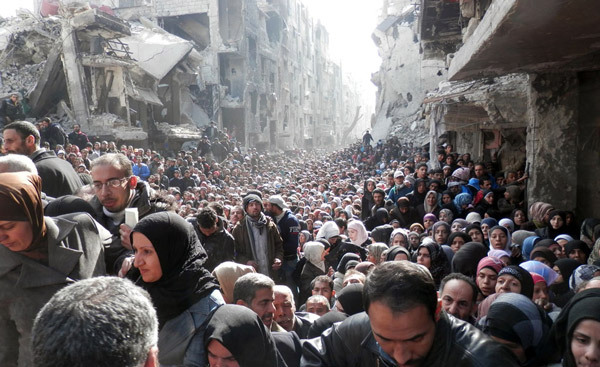 In January 2011, there were 526,744 registered Palestine refugees in Syria. Although they enjoyed better conditions than in other countries in the region, they lagged behind the host population in key development indicators. With the start of the upheaval in Syria, the majority of Palestinians, as well as the Palestinian Authority and Palestine Liberation Organisation, determined to remain neutral, mindful of Palestinian entanglement in the horrors of previous wars in other Arab countries. However, this neutrality did not last. When scores of Syrians fled heavy shelling in their own neighbourhoods and sought refuge in Palestinian camps, the fighting between opposition armed groups and the Syrian regime spread inevitably into the camps. The subsequent engagement of Palestinian factions in both sides of the conflict was a major factor that dragged the camps into the war. Palestinian refugee camps, including Yarmouk on the outskirts of Damascus, have been subject to repeated attacks and prolonged sieges by troops loyal to the Assad regime and by Syrian rebels. They have suffered shelling, destruction, and massive displacement. Up to 280,000 Palestinians are currently internally displaced, while 80,000 have fled to neighbouring countries: 42,500 in Lebanon, 16,000 in Jordan and the rest in Turkey, Egypt and Europe. As of February 2015, the known Palestinian casualties include 2,663 killed, 753 detained and 300 missing. Palestinian refugees have a unique legal status enforced through an exclusion clause in the 1951 UN Refugee Convention. At the time of the signing of the 1951 convention, Palestinian refugees were already receiving services from UNRWA and were thus excluded from the mandate of UNHCR (the UN Refugee Agency). However, Palestinian refugees outside UNRWA’s normal areas of operation or who are unable to access UNRWA assistance immediately fall under UNHCR’s mandate. In 1951, when Palestinians’ status was still unresolved, this exclusion was pushed by Arab states who feared that absorbing Palestinians would harm their right of return to their homeland. "Palestinians’ right of return is appropriated politically and continuously used as a pretext to violate their rights." Since early 2013, Palestinian refugees from Syria have not been allowed to enter Jordan. Those who are in the country cannot legally live in camps established for Syrians, nor in the long-established camps for Palestinians, or legally work. Lebanon followed suit in May 2014: Palestinian refugees are required to have documents for travel to a third country, limiting their stay to a maximum of nine hours and restricting their ability to renew residency papers, which puts them under the threat of arrest and deportation. In Egypt, Palestinians cannot register with UNHCR, and thus cannot get residency permits or receive UNHCR services. They are subjected to arbitrary arrest and expulsion. Turkey, by contrast, reportedly has an open door policy for refugees. Yet, even here there are reports of Turkish border guards pushing back or shooting refugees from Syria, and of Palestinian refugees being assaulted. UNHCR services are reportedly not reaching Palestinian refugees. Given the harsh realities affecting Palestinian refugees, an increasing number are opting to continue on to Europe on clandestine journeys filled with danger. Palestine refugees are entitled to protection under international law; the duty to protect refugees is enshrined in instruments such as the Geneva Conventions, the Convention on the Rights of the Child, and the International Covenant on Civil and Political Rights. Also, the principle of non-refoulement (no forced return to the country of origin) is a rule of customary international law, so it is binding on all States. Since the plight of Palestinians seems to be repeated for each generation, it is high time that a solution based on human rights and international law was implemented. UN General Assembly Resolution 194 has, after all, been a reference point for the international community since 1948. Palestinians fleeing the war in Syria to places outside UNRWA’s five areas of operation... should automatically come under UNHCR’s attention and mandate. Specifically, Palestinians fleeing the war in Syria to places outside UNRWA’s five areas of operation (Jordan, Syria, Lebanon, the West Bank and the Gaza Strip) should automatically come under UNHCR’s attention and mandate. European countries and countries taking part in the Syrian conflict should facilitate Palestinians’ resettlement initially in third countries as a matter of survival. The Palestinian leadership should continue to intervene and focus their efforts on ending the sieges in the camps, ending the suffering of Palestinians who remain in the country such as those incarcerated in the prisons, and finding safe passage from besieged camps for those who are not bearing arms. Unless these steps are implemented, there will be no change in sight and the suffering of Palestine refugees in and from Syria will continue. 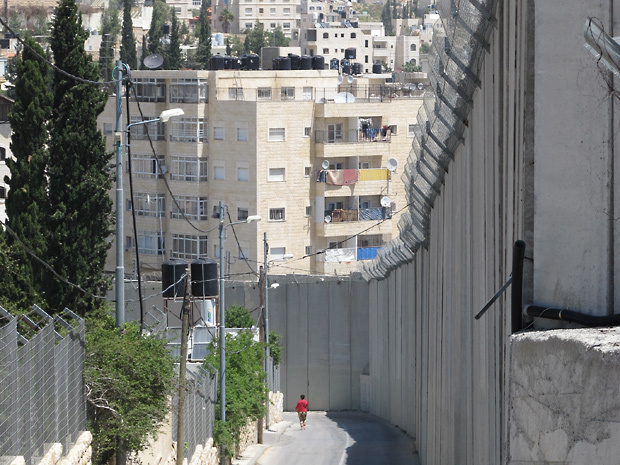 This blog is based on an Al-Shabaka policy brief of 20 October 2015: ‘Palestinian Refugees From Syria: Stranded on the Margins of Law’, by Mai Abu Moghli, Nael Bitarie and Nell Gabiam. Mai Abu Moghli is a PhD candidate at the Institute of Education, University of London. She holds a Masters degree in human rights from the University of Essex.